Capt. Isaac Seymour was born on 10 October 1723. He was the son of John Seymour and Lydia Mason. Capt. Isaac Seymour married Agnes Humphrey, daughter of Nathaniel Humphrey and Agnes Spencer. Capt. Isaac Seymour died on 14 January 1755 at age 31. George Nichols was baptized on 13 December 1741. He was the son of Cyprian Nichols and Agnes Humphrey. [S275] Frederick Humphreys, Humphreys, Vol. I, Page 123. Zillah Humphrey was born on 25 January 1726/27.1 She was the daughter of Joseph Humphrey and Abigail Griffin.1 Zillah Humphrey married John Hoskins Jr. on 26 November 1747. Children of Zillah Humphrey and John Hoskins Jr.
John Hoskins Jr. was born on 28 January 1715 at Simsbury, Hartford Co., CT. He married Zillah Humphrey, daughter of Joseph Humphrey and Abigail Griffin, on 26 November 1747. John Hoskins Jr. died in 1782 at Simsbury, Hartford Co., CT.
Elizabeth Humphrey was born on 22 April 1684. She was the daughter of Lt. Samuel Humphrey and Mary Mills. Lydia Humphrey was born on 7 November 1715. She was the daughter of Ensign Samuel Humphrey and Lydia North. Lydia Humphrey died in 1775. Julius Phelps was born on 5 March 1805. He was the son of Shubael Phelps and Ziba Griffin. Julius Phelps married Lucia L. King on 23 October 1851.2 Julius Phelps died in 1876. Laura was living in Washington, DC, at the time of her son's marriage there. Laua was enumerated in the 1920 Los Angeles, CA, federal census in the household of her son George Harvey Norton. Mrs. Laura Norton, age 96, passed away at the home of Mrs. Guy Wheeler in Eureka Tuesday. Funeral service was held from the Baird Funeral Home Wednesday at 1:30 p. m. conducted by Rev. Bert Sutton. Interment was in Greenwood cemetery. Mrs. Norton was the aunt of Mrs. Douglas Peebles and Mrs Blair of Eureka. [S446] Glenda Anderson, "Harvey Norton," e-mail to James H. Holcombe, 3 Sep 2003. [S459] MR: Greenwood Co. KS: Book A1, page 52. [S459] MR: Greenwood Co. KS: Book B, page 342. [S459] MR: Greenwood Co. KS: Book C, page 61. [S457] Eureka Herald, 17 August 1944. 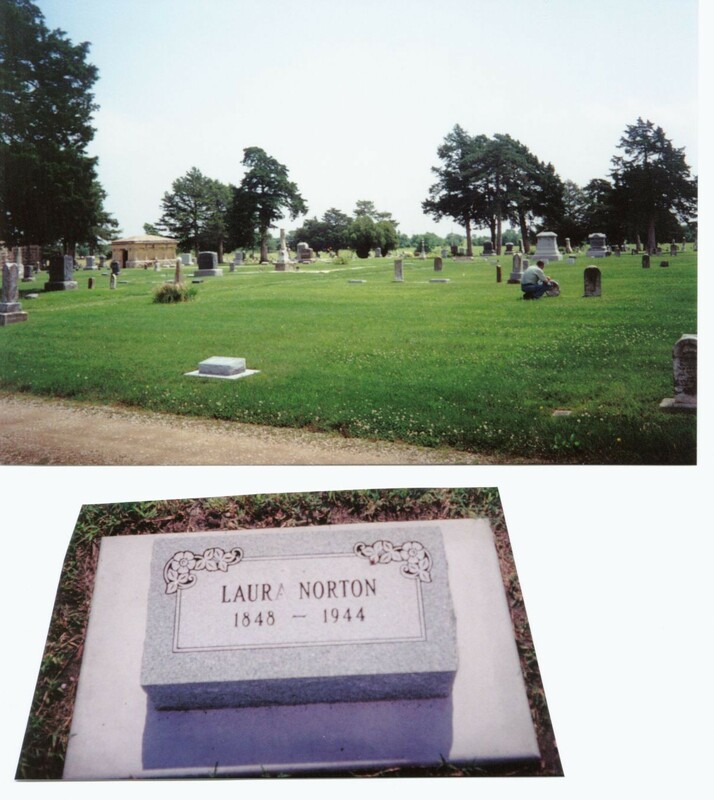 [S474] Laura (Lillie) Norton, DC: Laura Norton. "Charles H. Norton, of Lane Township died on Thursday, April 20, 1876, in the 35th year of his life. The deceased was born in Jefferson County, New York. His father emigrated at an early day to Mahaska County, Iowa, from whence the family moved to what was then Madison Co., KS, in the fall of 1858. That part of Madison Co. in which they settled was in Feb. 1862 annexed to and became a part of Greenwood County. Mr. Norton's father and one brother preceded him to the spirit land. He leaves an aged mother, a wife and one little boy and several brothers and sisters." (Note: At the first general election in Nov. 1862, Harvey Norton, father of the deceased was elected county clerk which position he filled for several years. Resolved, That we admiring the spirit exhibited by him as an earnest and faithful Patron, commend his example as worthy of imitation by all members of our Order. Resolved, That a copy of these resolutions be given to the family of our deceased Brother and a copy be furnished to the Eureka Herald and to the Spirit of Kansas for publication. /s/ Mrs. H.S. Cochrane, Committee...." From The Madison Star and also in the Eureka Herald. Charles (age 29) was recorded in the 1870 census of Lane Twp, Greenwood Co., KS, (film M593-434) with his wife (age 17), and baby George (age 4/12 mos). He was living next door to his brother Frederick. Their mother Frances, age 70, was living with him. Harvey was enumerated in the 1830 Houndsfield, Jefferson Co., NY, federal census. Enumerated were males 20-30 (1); males 5-10 (1); and males under 5 (1); females 20-30 (1); females 5-10 (1); and females under 5 (2). Harvey was enumerated in the 1840 Houndsfield, Jefferson Co., NY, federal census. Enumerated were males 30-40 (1); males 15-20 (1); males 10-15 (1); males 5-10 (1); males under 5 (3); females 40-50 (1); females 15-20 (1); females 10-15 (2); females 5-10 (2). Harvey Norton and Fannie Austin resided at Watertown and Sacketts Harbor, N.Y. until the Spring of 1844 when they with their family of ten children moved to what is now Mahaska County, Iowa, but then a territory in possession of the Indians. Their two months' journey to this new home was made by water. (*See below story of Mahaska Co., IA, from "A Short History of Mahaska County, Iowa, from A.T. Andreas' Illustrated Historical Atlas of the State of Iowa, 1875) There Mrs. Frances Prichard, their 11th child was born. In the Spring of 1858 during the Territorial War, they moved to Kansas, settling near Madison, Greenwood Co., KS. Harvey and Fanny were enumerated in the 1850 Oskaloosa, Mahaska Co., IA, federal census. He was 47, she was 50. Children in the household were Austin 19, Emma A. 18, Eunice J. 16, Walter 14, Frederic 12, Charles 10, and Frances 6. *From "A Short History of Mahaska County, Iowa, from A. T. Andreas' Illustrated Historical Atlas of the State of Iowa, 1875", which sheds understanding of the above "journey to this new home WAS MADE BY WATER": "The mode of access to this county during its early history was by water to Keokuk, the "Gate City" (so called because it was the gateway to the territory northwest as far as Des Moines), thence up the Des Moines River by such rode water craft as could be procured to points whence the immigrants could make their way to their destined location by team and wagon. The way was roundabout and the journey long and slow, yet such means of communication with the outer world were then regarded as exceedingly valuable and convenient. Hence the settlement which extended up the Des Moines River valley was the first of any great importance that penetrated far into the interior of the state. This was before the era of direct and rapid communication by rail. Then Mahaska County was away in the far west, a long distance beyond civiliazation. Now it is the home of civilization, with all its best institutions. The river has been abandoned for the ready communication to the rail, and the county is traversed by numerous railroads." Harvey and Fanny were enumerated in the 1860 Verdigris Twp., Madison Co., KS, federal census. He was 57, she was listed as 16 but that was probably the daughter Frances listed later. Children in the household were Frederick 21, Charles 19, and Frances 16. From History of Greenwood County, Kansas, Chapter 5: The Establishment of Greenwood County Government, p. 24...."Janesville continued to serve as the county seat until November 17, 1866, when an election was held to locate the county offices permanently. Eureka received 91 votes, Philadelphia (located where the Pleasant Valley School house was at 6-25S-12E about 5 miles southeast of Hamilton) received 68 votes and scattered votes for other sites failed to produce a majority. A second election on November 27, 1866, gave Eureka 116 votes and Philadelphia 112. (Today the townsite of Philadelphia is a plowed field.) The county records were then brought to the new county seat of Eureka on horseback by CLERK HARVEY NORTON, who carried the files of his office across his saddle in a grain sack. Most county offices in earlier days had been held in the officers' homes, and people having business with them were their guests. One story relates how NORTON, upon riding up to a little store which at the time served as a court room, town hall, and place of general utility, had joked that he "had the county seat of Greenwood County in that sack. "/S/ The History of Greenwood County, Kansas", Vol. 1, pp. 24-25. "Mr. Harvey Norton has a splendid farm on the Verdigris. He knows how to use it too, if we judge from the splendid specimens of wheat, oats, corn, &c., that he shows us. He says that he raises every year from 15 to 20 bushels of spring wheat to the acre. This year we think he will have more. He had one of the finest sweet potato patches we ever saw. We are indebted to him for much valuable information concerning the county generally." From The Eureka Herald..December 3, 1869, Page 3, Column 1: "We regret to learn that Mr. Harvey Norton is very sick and not expected to recover." The Eureka Herald, December 24, 1869, Page 2,Column 4: "State of Kansas, Greenwood County, December 7 A.D. 1869. Notice is hereby given to all persons interested that the last will and testament of Harvey Norton, late of said county, deceased, has this day been filed in the office of the Probate Judge of said county. Proof in authentication of the same will be heard by the said Probate Judge at his office in Eureka on the 8th day of January A.D. 1870 at 2 o'clock p.m....James Kenner, Probate Judge". I, Harvey Norton, being advanced in years, but of sound and disposing mind and having in view the uncertainty of human life and wishing to settle my worldly affairs in a manner satisfactory to myself, and to prevent uncertainty hereafter in regard to my wishes as to the disposal of my estate and effects, do hereby make and constitute this as my last Will and Testament. ITEM 1st: It is my will that all the personal effects and stock now on my farm in Greenwood County, Kansas, or belonging to me individually or jointly with my son, Charles H. Norton, shall be disposed of according to the terms of a partnership contract existing between myself and my said son, Charles H. Norton, that is to say, One half each, of all the stock, effects, produce and other personal property, to my wife, Frances Marian Norton, and my son, Charles H. Norton. ITEM 2nd. It is my will that no part of the real estate now belonging to me shall be sold or alienated during the life time of my beloved wife, Frances Marian Norton, but shall be occupied and used by my son Charles H. Norton during said period, after whch it is to be sold and the proceeds divided among my legal heirs. ITEM 3rd. It is my will that after the division of the personal property between my wife and my son, Charles, as provided for in the contract herein referred to, that portion of the effects, stock, farming implements then falling to the share of my wife, shall remain on the farm to be used by my son Charles during the lifetime of my wife, and at her death all the original stocks, implements and effects of her share, except one half of the increase of her livestock, shall be sold, and the proceeds equally divided amongst my legal heirs--the other half of the increase of said livestock I give and bequeath to my son Charles. ITEM 4th. It is my will that my said wife continue to live with, and is to be supplied by my son Charles H. Norton, during the remainder of her lifetime. That he shall take care of and properly keep her and provide for her comfort and wants and, also, to provide food for her stock and deliver to her, as she may wish it, one half of the increase of her said stock in consideration of which I hereby will and bequeath to my said son all the farming products of my real estate, during the lifetime of my said wife. ITEM 5th. It is my will that my half of the grain now on the farm shall be used for the support of my wife, after defraying the expenses of my funeral and payng my debts. And, finally, having full confidence in his honesty and integrity, I do hereby name and appoint as Executor of this, my last will and testament, my son John Austin Norton, and I do adjure him to carry out, to the letter, the will and wishes of his dead father. This will was reduced to writing in accordance with the wishes and at the dictation of Harvey Norton on the 1st day of December, A.D. 1869, by Charles Sweney. 1860 KS Territory Census, Madison County, Verdigris Twp, enumerated 10 August 1860 by E. Goddard shows: Lines 11-15, Dw 825, Fam 642: Harvey 51, Farmer, b. VT; Fanny M. (age incorrect; age shown is of their dau, Frances) b. CT; Frederick, 21, Farmer, b. NY; Charles H., 19, Laborer, b. NY; Frances, 16, Housework, b. IA. Copied from The Madison Star, 8 Feb 1895..... Last Friday, Fannie Norton died. She was born March 2, 1800 in New Haven, Conn. During the War of 1812, her father, Benjamin F. Austin with his family moved to the wilds of New York State where in 1820 she married Harvey Norton. They resided at Watertown and Sacketts Harbor, N.Y. until the Spring of 1844 when they with their family of ten children moved to what is now Mahaska County, Iowa, but then a territory in possession of the Indians. Their two months journey to this new home was made by water. There Mrs. Francis Prichard, their 11th child was born. In the Spring of 1859 during the Territorial War they moved to Kansas. She was raised a Presbyterian. Five children preceded her in death. She died Jan. 28, 1885. Miss Effie Prichard came down from Emporia Wednesday morning to attend the funeral services of her grandmother...(sent by Melinda Norton, Edmond, OK). Harvey and Fanny were enumerated in the 1850 Oskaloosa, Mahaska Co., IA, federal census, (stamped page 188). He was 47, born in NY; she was 50, born in CT. Children in the household were Austin 19, Emma A. 18, Eunice J. 16, Walter 14, Frederick 12, Charles 10, and Frances 6. When Harvey wrote his will shortly before his death, he provided for Fanny but only mentioned sons Charles H. and John Austin. [S336] Ancestry.com, Probate Court General Index, 1857-2003 and Court Cases, Ca. 1858-1920, Greenwood County, Kansas; Author: Kansas. Probate Court (Greenwood County); Probate Place: Greenwood, Kansas. Frances Marian Austin was born on 2 March 1800 at CT. She was the daughter of Benjamin F. Austin and Jerushia Mather. Frances Marian Austin was also known as Fanny Austin. She married Harvey Norton on 15 November 1821 at Sacketts Harbor, Jefferson Co., NY.1 Frances Marian Austin died on 28 January 1895 at age 94. Benjamin and Jerusha were enumerated in the 1850 Hounsfield, Jefferson Co., NY, federal census. He was a mill wright. The were in the household of son-in-law Joshua and Anna (Austin) Harlow. In Sacket’s Harbor, N. Y. on the 13th inst., Mrs. JERUSHA MATHER AUSTIN, consort of Mr. Benjamin Austin, and mother of Rev. J. M. Austin, aged 88 years. After a sojourn of more than four score years on this earth, this venerable mother in Israel has passed to her home in heaven. During her long career, she bore an irreproachable reputation as a wife, a mother and a neighbor. Her life was distinguished for love of religion, a kind and charitable spirit, great benevolence of heart, and uncommon cheerfulness of disposition. For more than thirty years she has been an unwavering believer in Jesus as the Saviour of the world; and in her daily walk endeavored to reduce to practice the teachings of this beautiful faith. It was her comfort, her joy, in life and her consolation in the hour of death. The deceased was a native of Lyme, Conn., from whence, more than fifty years since, she removed with her venerable husband, who still survives her, to north-western New York, then nearly a wilderness. She has left behind, to mourn her departure, a husband, six children, forty-three grandchildren, and several great-grandchildren… Her funeral took place on the 15th inst., and a sermon appropriate to the occasion was delivered by Rev. Pitt Morse. [S472] Horace E. Mather, Mather, Page 130. [S469] Elizebeth B. Plimpton, Lyme VR, Page 25. Frederick Augustus Norton was born on 31 October 1838 at Sacketts Harbor, Jefferson Co., NY. He was the son of Harvey Norton and Frances Marian Austin. Frederick Augustus Norton married Laura B. (?) Frederick Augustus Norton died on 31 March 1912 at Ripley, Payne Co., OK, at age 73. He was buried at Ingalls Cemetery, Ripley, Payne Co., OK.
Frederick and Laura B. were eunmerated in the 1870 Lane, Greenwood Co., KS, federal census. He was a farmer, age 31; she was 20. Children in the household were John R. 3, and Loretta W. 1. Walter H. Norton was born on 5 May 1836 at Sacketts Harbor, Jefferson Co., NY. He was the son of Harvey Norton and Frances Marian Austin. Walter H. Norton died on 2 May 1877 at Eureka, Greenwood Co., KS, at age 40. [S469] Elizebeth B. Plimpton, Lyme VR, Page 248. [S469] Elizebeth B. Plimpton, Lyme VR, Page 16. [S469] Elizebeth B. Plimpton, Lyme VR. [S472] Horace E. Mather, Mather, Page 107. [S472] Horace E. Mather, Mather, Page 75. [S469] Elizebeth B. Plimpton, Lyme VR, Page 229. Phoebe De Wolf was born on 20 January 1691 at Lyme, New London Co., CT.1 She was the daughter of Simon De Wolf and Sarah Lay. Phoebe De Wolf married Lt. Joseph Mather, son of Richard Mather and Catherine Wise.1 Phoebe De Wolf died after 1736. Simon De Wolf was born in 1648 at Hartford, Hartford Co., CT. He was the son of Balthazar Dewolf and Alice (?) Simon De Wolf married Sarah Lay on 12 November 1682 at Lyme, New London Co., CT. Simon De Wolf died on 5 September 1695 at CT.
Sarah Lay was also known as Sarah Lee. She was born circa 1663. She married Simon De Wolf, son of Balthazar Dewolf and Alice (? ), on 12 November 1682 at Lyme, New London Co., CT.
Humphrey Atherton was born circa 1608. He died on 16 September 1661 at Dorchester, Suffolk Co., MA. came to America in 1635 or 1636, accompanied by his wife, Mary Wales. They settled in the Dorchester, Massachusetts, area and soon raised a large family. Soon after his arrival, he established himself as a leader of the colony. He was elected as a selectman of Dorchester in 1638 and represented the town in the General Court. In 1653, he was chosen speaker of the house of deputies, and the following year he became an assistant to the governor. Humphrey Atherton was also involved in the colony's military affairs. He became a member of the Ancient and Honorable Artillery Company and was its captain from 1650 to 1658. He commanded the Suffolk Regiment, with the title of major general, and served as the chief military officer in New England. John Austin Norton was born on 15 March 1830 at Sacketts Harbor, Jefferson Co., NY. 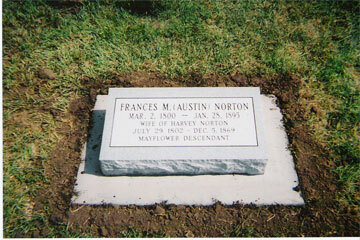 He was the son of Harvey Norton and Frances Marian Austin. John Austin Norton died on 6 December 1869 at Madison, Greenwood Co., KS, at age 39.